Talking of smoking, there is some rather encouraging legislation coming into effect next year here (in Kanawaga prefecture, it is not national). Smoking in public buildings (which includes things like restaurants and hotels as well as schools and hospitals) is going to be restricted, with all facilities above a certain size being obliged to introduce no-smoking areas. As seems usual here, the legislation itself is actually rather toothless (penalties are feeble and there are many exemptions), but it may be that public opinion will encourage a level of compliance that goes some way beyond the strict letter of the law. It is at least a step in the right direction. 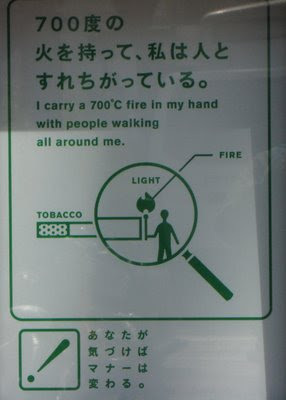 Kamakura itself seems to have some new no-smoking signs up in the middle of town that come into effect on April 1. 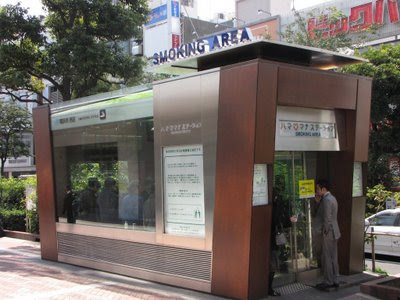 Yokohama has recently gone no-smoking in the streets around the station, and here is a "smoking area" shelter, complete with cheesy slogans on posters. Also, JR East (the train company that dominates the network here) is going completely no smoking in all stations in the Tokyo area - up to now there have been some smoking areas which, although towards the end of the platforms, are often close enough to where we are sitting to be annoying. So perhaps it's not revolutionary, but it is definitely evolutionary. It's been quite remarkable to observe how quickly things have changed here - a poky smoky cafe or restaurant was pretty much par for the course when we arrived, but now it's quite rare for us to actually be annoyed by smokers. As I noted some time ago (but only posted just now...), the JGovt has decided that we don't burn enough oil in this country, and decided to do something about it by reducing the tolls on the long distance expressways. It seems quite sensible really, as the oil literally pours out of the ground here faster than we can collect it in barrels, there is no decent public transport, and an august advisory body recently concluded that man-made global warming is a myth anyway. Also, the roads are also far too quiet, and having spent all that money building them we might as well get as much use as possible out of them! Having comfortably exceeded their Kyoto commitments, the JGovt obviously wants to make sure the baseline is as high as possible for any future emissions reductions. The first results are now in, and I'm happy to say are very encouraging. Traffic on major routes is up by about 50%! Hopefully the data will be useful for those who are interested in questions of price elasticity. Rumour has it that there are now plans for tax rebates on patio heaters and SUVs. Japan is worried that it has made such strong progress towards its Kyoto protocol goals [:-)] that it has decided to boost car driving so as not to show the rest of the world up. For the next two years, all expressway tolls have been cut to a maximum of ¥1000 on holidays and weekends. As an indication of the scale of this discount, I worked out on Navitime that our summer holiday trip to the mountains (300km) would have cost about ¥7000 each way in tolls. [There is a toll-free alternative for those who want to crawl through every little village on the way, but it would take twice as long.]. Of course the cost of motoring that distance is significant too, depending how you work it out it might be about the same amount. The train fare is about ¥8000 each way, making that choice a very reasonable one even for two people (as we are). But at ¥1000 for the tolls there would be a substantial saving for the driver. So slashing the tolls should encourage more people into their cars for long-distance drives along the expressways rather than sitting in the express trains running along the lines parallel to their roads. Let's Driving! This interesting article in Wired is the only attempt I have seen to explain some details of the recent financial upheavals in terms that a mathematically literate non-specialist should understand. It lays the blame at the inappropriate application of a elegant formula for estimating the risk of coupled investments according to the correlation of their prices. The correlation is unknown a priori (indeed it's not obvious to me that such a thing even exists given the fractal nature of market prices) so the general approach was to estimate the correlation based on historical data of how the market prices had covaried in the past. For investments that had not been around for very long, this is obviously going to be rather approximate, even if the underlying principles had been sound. It seems quite clear from the article that everyone who looked into it (including the formula's originator) knew that this application was inappropriate, but the bankers all did it anyway. Without it, they would not have been able to bury the time-bomb of the ludicrously-named "sub-prime" mortgages to sell on to unwitting dupes. We've been playing with our new cameras and enjoying some fine weather. The magnolia are flowering which is a sure sign of warmer weather. 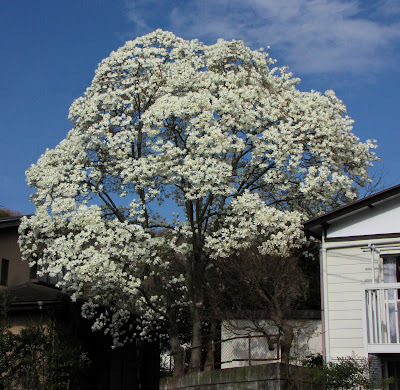 Although we've visited several local temples, the best magnolia is actually just down the road in someone's garden. At this time of year there is often a handful of people photographing it. Not very much more, thankfully. But this nonsense moulders on miserably in a couple of places. More amusingly, the National Post (which nation?) has a column which blends Kusano's idiocy with Michael Tobis's recent misquote. And there is also an article in The Australian with some further comments from the Japanese debators. One point that may be of interest is that the debate's organiser seems very keen to emphasise that the various documents do not represent any sort of official position statement of JSER, contrary to the Register's misleading report. This article about hot springs caught my eye and I was surprised to see no mention of Japan...until I re-read the title and realised it was just focussing on Europe. As it happens we've been to number one on their list - the Landmannalaugur end of the famous Landmannalaugur-Þórsmörk trek (spot the cut and paste) that we tacked on to a scientific meeting back in the summer of 2000. From what I remember, the "hot pool" consisted of a cold stream with scalding hot water trickling in to the top, and any attempt at stirring whipped up the sand off the river bed. Not the most luxurious experience, and certainly not a patch on the more spectacular Japanese onsens. Roger, you say that our present policy is not commensurate with the risks. I presume this means you too accept that there are very large risks in a delayed-policy scenario. Is this so? This in turn places a very large ethical weight on any public speech, does it not? At which point Roger ducked, quoted Michael out of context on his own blog, and spun up a (thankfully brief) denialist blogstorm. Others have editorialised at more length, but I think the evidence speaks for itself, for those who can be bothered wading through it. OK, a few people have asked me about this study. So far it's only a department report but no doubt there is a paper in preparation somewhere. 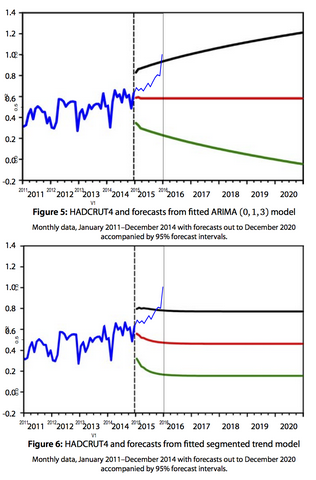 There is stuff about emissions scenarios which I am not going to comment on here, instead focussing on the physical climate science. Executive summary: I don't believe it. It shares several of the same old problems that all of the probabilistic prediction work exhibits. I hope that the GCM-based community realises what a strong threat this sort of analysis poses to their credibility, and also understands the work well enough interpret it realistically. Basically, this report claims that all the GCMs are rubbish, and indeed (with high probability) horribly biased in the same direction, even though each GCM is validated in far more detail than any of the MIT model instances has been. First the good bit: they have abandoned the uniform prior for sensitivity, although no reasoning is given. Of course we all know why they did this but I don't mind admitting it rankles to see absolutely no acknowledgment of the substantial amount of time and effort I put into correcting this widespread misunderstanding over the past few years (most recently here, still awaiting reviews). I do realise the "expert prior" they use predates my involvement in the field, and indeed this same group have used it before, but previously results generated in this way have always been deprecated in comparison with those based on a uniform prior (which they have also always used, and presented as the main analysis). The IPCC even refused to mention their previous expert prior results (which I had specifically requested to offset some of the uniform prior nonsense). "However, changing the diapycnal coefficient also alters the ocean circulation, in particular the strength of North Atlantic overturning (Dalan et al. 2005a). Unfortunately it appears infeasible (certainly without changes to parameterizations in the 3-D models) to vary the heat uptake over the full range consistent with observations during the 20th century (Forest et al. 2008) and at the same time to maintain a reasonable circulation. " I believe the correct way to interpret this situation is that it is fortunate that the extreme ocean diffusion parameter values tested give unrealistic behaviour because it implies that this analysis provides a tighter constraint on ocean mixing than we can glean from the very limited observation of warming rate. If they had taken advantage of this understanding, their results might have been more credible. As it is, they are using parameter values that they know are strongly inconsistent with the real behaviour of the climate system. Another problem is in the way they handle volcanic forcing. There have been multiple instances of large volcanic eruptions over the well-observed historical period, and each time this has resulted in a brief 1-2 year cooling spike. It is well-known that this is supportive of both mid-range sensitivity and ocean heat uptake - it is certainly difficult to reconcile both a high sensitivity and low ocean mixing with these observations, as this would result in a much longer and stronger cool period than has ever been seen. However, this MIT analysis only looks at the long-term trend. Over this interval, volcanoes provide a modest cooling (eg pic in this post) due to the preponderance of eruptions in the latter half of the 20th century. The authors explicitly state that in their analysis, the influence of volcanoes is to shift their estimate towards both higher sensitivity and low ocean heat uptake, even though the interannual behaviour should downweight that possibility.